The New Year’s holiday in Russia is special. It is far and away the most important holiday of the year and accordingly many traditions are associated with celebrating it. Many of these rituals are quite specific to Russia and differ from how other people around the world celebrate winter holidays. RBTH has collected the top 10 things you need, or else it isn’t Russian New Year’s. The West may have Santa Claus, but he can hardly compete with “Ded Moroz” (Grandfather Frost) or his granddaughter, “Snegurochka” (the Snow Maiden). Unlike Santa Claus, Ded Moroz is not afraid to show his face and often stops by holiday parties with Snegurochka to deliver presents in person. Ded Moroz maintains his residence near the town of Veliky Ustyug (in the Vologda Region); Snegurochka supposedly resides in Kostroma, on the Volga. Christmas trees were banned shortly after the revolution but were reintroduced as the novogodnaya yolka (New Year’s tree) in 1935 as a secular holiday symbol. Trees tend to be small and are often made of plastic, but they are still symbolic and important gathering symbols for Russians. Many countries have popular traditional holiday films, but few can match up with the song and steam of the Soviet classic, The Irony of Fate or Have a Nice Bath (1975). Zhenya is engaged and plans on spending his New Year’s Eve with his fiancée. However, he first must go to the sauna, as per tradition with his friends. They all get intoxicated and Zhenya ends up on a plane to Leningrad. He drunkenly tells a taxi driver to take him to Third Builder’s Street, where he lives in Moscow. Remarkably the building looks the same and his key fits. He passes out in the apartment and is awakened by the unsuspecting Nadya. They fall in love, and Russians still can’t get enough of this film. Television shows such as Goluboi Ogonyok (Little Blue Light), Pesnya Goda (Song of the Year; features most top-tier celebrities) and the children’s filmMorozko (Grandfather Frost) are additional holiday staples. New Year’s just isn’t New Year’s without the salads. We’re not taking about light green salads either, but mayonnaise-infused and protein-thick works of art. Russians consume 2.5 kilograms of mayonnaise annually and nowhere is it celebrated more than on the holiday table. Olivier salad is usually made with mayonnaise, potatoes, carrots, pickles, green peas, eggs and chicken or bologna. New Year’s literally doesn’t exist if this salad is not on your table. Selyodka pod Shuboi, or “Herring under a Fur Coat” is a layered carnival filled with herring, potatoes, carrots, beets, onions and mayonnaise. The beets give the salad its purplish color. Supposedly this tradition began back in the reign of Nicholas II. However, it was discontinued for decades due to the Soviet Union’s difficulty in growing or importing them. 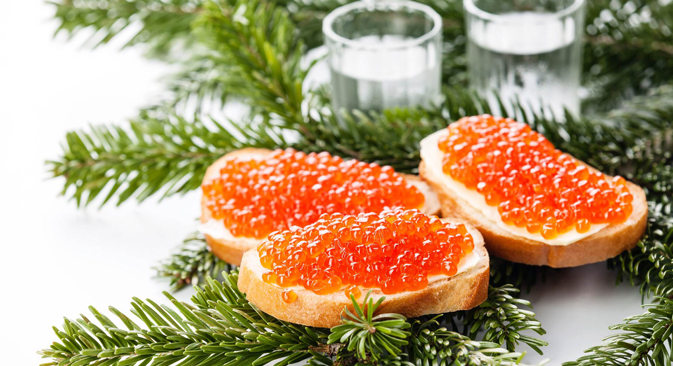 It was revived around the 1970s and remains a staple on every Russian New Year’s table. Nothing said “proletarian” in the worker’s paradise more than champagne and caviar. While these items were in shorter supply during the Soviet period, it was then that they became part of the New Year’s tradition. The champagne is usually the “Sovietskoye” variety, available everywhere from Kamchatka to Brighton Beach. The caviar is usually red and served on buttered bread. Regardless of their political affiliations, Russians around the world tune in to hear the Russian president offer his wishes for the upcoming year. Once he finishes, the clock tower on Red Square chimes, fireworks burst into the air and the New Year officially begins. For Russians, New Year’s is a family holiday and celebrations take place with close relatives on the evening of Dec. 31 with traditional toasts to say goodbye to the passing year. Phone calls are made to relatives that live far away. It is only after midnight that people begin the real partying. Many clubs only begin their main events at 00:30 or later. As one person told me, it isn’t New Year’s if you don’t see the equivalent of a small country’s budget blown up in fireworks. The first New Year’s holiday I spent in Russia, in the industrial city of Tolyatti, involved hours of celebrating at home before going out after midnight with the whole family to see the citizenry declare war on the central square. The fireworks display was intense, loud and bright and is an integral part of any Russian New Year’s holiday. Perhaps the best part about Russian New Year’s is that it’s not back to work the next day or even the day after. In 2015 Russians have until Jan. 12 before they have to report back to the office. That’s 11 days to shake off their hangovers.